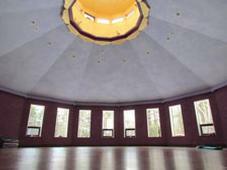 Prakasa Yoga Studio is available to rent. If you are looking for a one-of-a-kind location to make your event memorable, please contact us. Our private country location makes Prakasa Yoga Studio the perfect place for any contemplative program, joyous celebration, family gathering or special event. We are located on over 10 acres of natural woodlands and surrounded by 1,000's acres of untamed forest. Trails for a hike, ski or snowshoe run right out of our back door. The neighborhood is very quiet and peaceful all year round. As soon as you step onto our property, the beauty of nature and serenity of our studio will envelope you. Our location provides easy access from Northampton, Pittsfield, Shelburne Falls and points further away. We are only 1.5 miles from the intersection of route 9/112, both major state roads that link Western Massachusetts to Vermont and New York. 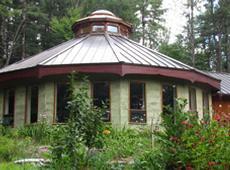 Prakasa Yoga Studio is constructed with sustainable, non-toxic materials and low VOC paints. The beauty of our design was created for special, spiritual and sacred gatherings. The twelve-sided studio represents the heart chakra and as a geometric shape is ideal for any gathering, as it naturally creates a sacred and peaceful space. We have hosted weddings, family parties, graduations, life celebrations, spiritual retreats, meditation retreats, musical concerts, kirtan, poetry readings and workshops. Our aim is to keep our studio rental fees affordable. To this end, our facility is available with or without the use of our beautiful grounds. When planning an event, you may choose either option. Weekend/Multiple Day Rates vary, please call for more information. Note: Saturday the studio is available at 11am. If you require an earlier start, we can accommodate you depending on our program schedule. An additional fee will apply if we need to cancel our morning class to accomodate your needs. Please use the contact us page and send us an inquiry for any type of rental. Tell us what type of event you are planning and what your needs are. If you are a teacher, bodyworker or therapist: we can offer an hourly rental rate commensurate with your fees. Please contact us for details, prices and availability. "Thank you for facilitating a beautiful celebration for our family. We will remember it for years to come. The space was perfect and beautiful. Working with you was easy. Everything was so very wonderful and everyone loved Prakasa. - Jesse M., Boston, MA.